Whether you like it hot and cold, this easy blender eggnog comes together in minutes and is redolent of brandy and nutmeg. The frothy head makes this holiday treat all the more decadent! 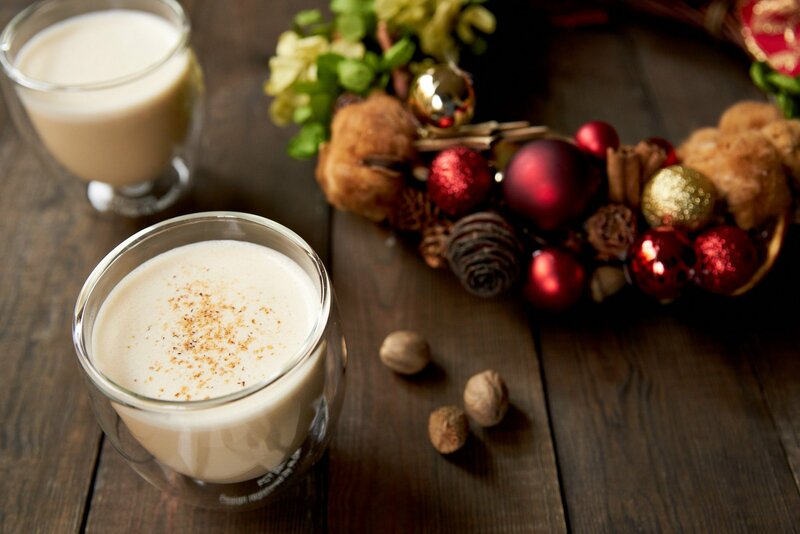 Eggnog is one of those traditional holiday foods that went from seasonal treat to culinary pariah over the past century. Along with jewel speckled fruitcakes and mincemeat pie, it’s become an anachronism from a bygone era when we didn’t think twice about eating eggs raw, and cholesterol was nothing more than a scientific curiosity. I don’t know if health concerns had anything to do with eggnog’s waning popularity, but the artificially flavored travesties sold in stores these days would turn even the most ardent ‘nog-lover off of the creamy, eggy concoction. 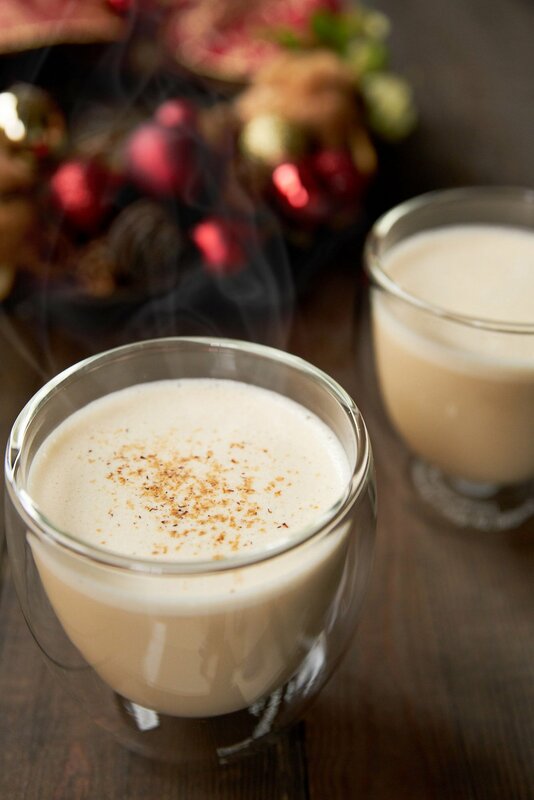 Recently I’ve seen aged eggnog making a comeback in the craft cocktail scene, but who has time (or the refrigerator space) to prep this holiday tipple in summer for consumption during the holidays? That’s why I came up with this quick hack that produces a delightfully full-bodied eggnog, that’s satisfyingly rich without being thick or cloying. The trick is to whip some eggs in a blender and then heat all the other ingredients until piping hot, before blending it all into a soul-warming elixir with a frothy head that’s sure to get you into the holiday spirit. Consumed warm, it will take the chill of the most frigid of winter days, but this eggnog is satiny smooth and delicious chilled as well, so there’s no need to feel like need to drink it all in one sitting (though it may be tempting. I like using a 2:1 ratio of milk to cream for this to keep it from becoming overly rich, but you can certainly increase the amount of cream if you’re in the mood for something even more decadent. As for the booze, I used Armagnac, a kind of brandy but I’ve made it before with everything from rum, to bourbon to shochu and it’s all good. If you want to reduce the alcohol content, but still get the flavor of the brandy, you can boil it down for a bit before adding the milk, cream, and sugar. I hope you enjoy this eggnog and have a wonderful holiday season! Add the eggs to a blender and blend until a light creamy color. In a small saucepan, heat the sugar, milk, cream, vanilla and brandy (optional) until it's steaming hot, but not boiling. 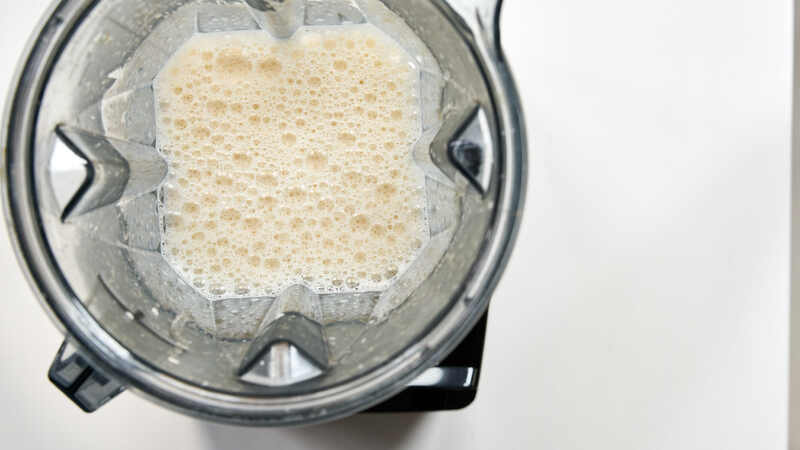 With the blender running on medium speed, slowly pour the hot milk mixture into the egg mixture through the lid. Serve hot in small glasses with some nutmeg grated on top. *Although the eggs should, in theory, be cooked by adding the hot milk mixture, it's better to be safe than sorry, so I recommend you use pasteurized eggs for this recipe. I love eggnog. It’s a guilty pleasure of mine. Thanks for the recipe! i LOVE eggnog too! im looking forward to testing this out! Marc, unlike the dried fruit brick, eggnog has always been embraced by my troops. And I know I would enjoy yours, except, I’d prefer a bigger glass. I, for one, adore eggnog, but I have to admit I’ve only had the store-bought kind. I am too afraid to make it at home, which is silly, I know. Another dragon to slay in my kitchen, I suppose! Thanks for the holiday cheer post… I’m slowly getting into the swing of things, despite the CA weather! Mmm, now this sounds like it will warm you up on a cold winter night. I’ve never tried egg nog warm. I’m gonna give this recipe a whirl. I love homemade eggnog, hot or cold. And it’ll be the perfect thing to sip on and reminisce. This year has been a difficult one. I hope things look up in the coming year! My nephew is a chef, and he was just telling me this weekend that I need to get an eggnog recipe on my site. This looks fabulous. I remember drinking eggnog as a teenager at a friend’s house for Thanksgiving. The excessive amount of eggs always freak me out a little bit too. LOVE warm eggnog 🙂 but in my house, bourbon isn’t optional for it. I can’t wait to make it this season. Love your Bodum glasses for it too! Mmm eggnog is soo tasty. Nice recipe & pics! Marc–I love this warm version. How fantastic. Next time, add some salt–I think it will put it right over the top, like boozy, warm vanilla pudding. And how could that be a bad thing? I’m a sucker for all those mistreated holiday goodies- mincemeat pie, fruitcake, and definitely eggnog! I just wanted to let you know that I’m interested in learning more about Blog Away Hunger for my blog, and that I love your site! Also, I tried out your crustless pumpkin pie for Thanksgiving this year, turned out fantastic! Rather than the cardamom (mom’s spice rack was lacking) I used cinnamon, orange zest, nutmeg, maple sugar, and cloves. I served it with a warm maple-rum sauce. Delish! Just tried your recipe for its simplicity. It does exactly what you promised, and I think it ended up a little too light for what I was craving. But it was pleasingly simple, extravagantly foamy, and had just the right flavor. Wow just tried your recipe,so easy and amazing taste..Didn’t have bourbon so i replaced some of the cream with a tablespoon of brandy cream.. I really fancy trying this but I don’t know what the unit of measurement C is? Could you advise please. To mitigate against my ignorance I just wanted to let you know that I’m from the other side of the pond. so as long as you’re using the same proportions you should be okay. Ah yes – Cups – of course. Thank you. Sorry – I think there is now something missing. 1 cup of half and half – what?? coffee and tea. You can make it yourself by mixing milk and cream. i am reading the warm egg nog recipe, excuse my ignorance but what is half and half? you should be able to pick up a pint of half and half at any supermarket. I’ve been trying to find a quick, simple recipe for warm egg nog. I’m afraid yours has too much verbiage. I have no idea what you mean by “bring 2 eggs up to room temperature”. I keep my eggs at room temp all the time! You do not say how many servings this recipe makes. I skipped all the bumph about Thanksgiving. I just want to know how to make a good warm egg nog! Sorry, thumbs down on this.